Hi Bryan, Thank you for being our Scientist of the Month. You said you design experiments. What are some of your experiments like? 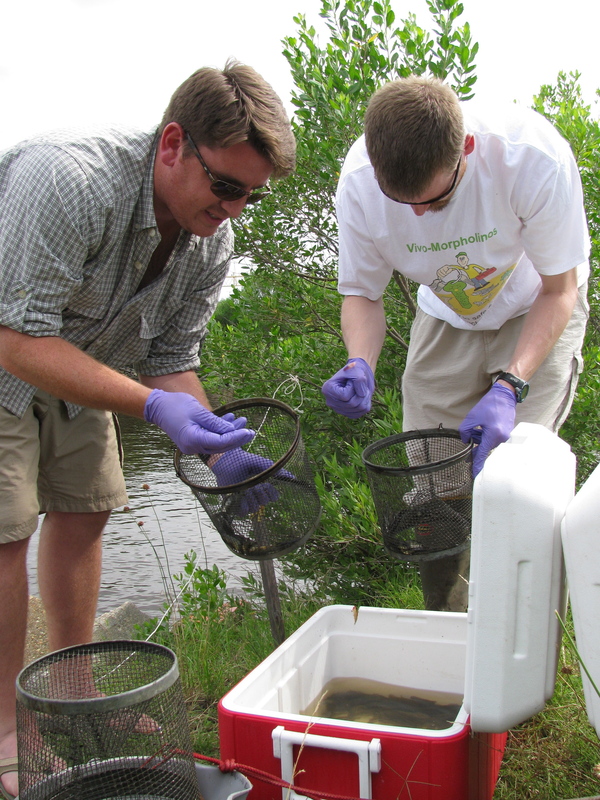 Are mumichogs only found in estuaries and why are estuaries so full of poisons? What are the most common poisons found in fish and where do the poisons come from? Why do the mumichogs glow red? Why kind of fish is the picture on the computer screen? Hey 1st graders – these are really great questions! What are some of your experiments like? 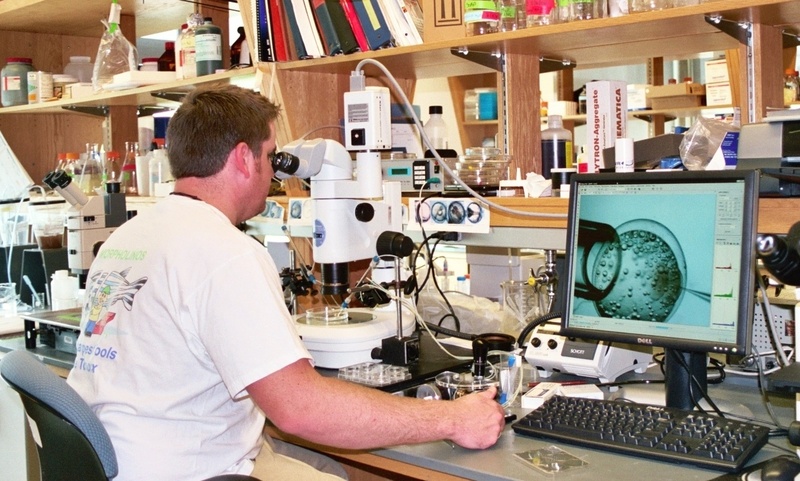 One type of experiment that I do a lot uses chemicals called morpholinos to help me understand if certain proteins in the developing fish are involved in how a poison hurts the fish. Morpholinos block specific proteins from being made from a gene. I inject the morpholino (like in picture 3 above) to stop a protein from being made in the egg, then I expose the eggs to a chemical and examine them to see if they still are affected by the chemical. I am also doing experiments to learn if changing temperature affects how chemicals affect fish. You may have learned that the overall temperature of the planet is going up, and that certain types of pollution are causing this. We are testing to see if increasing the temperature in the water causes fish to keep more chemical in their body, and if the higher temperatures make the chemicals even more dangerous for the fish. Yes, mummichogs are only found in estuaries. They like the habitat there, especially the relatively shallow tidal water with marsh grasses and oyster shells to hide in and lots of good food to eat. Estuaries have a lot of poisons in them because they are at the very end of rivers, so everything that goes into the river eventually makes its way down to the estuary. Also, because estuaries are right where the land and the ocean meet, they are often where we choose to locate the factories and shipping industries that are sources for a lot of the pollutants. The most common pollutants found in fish are certain metals (like mercury), some industrial chemicals (like polychlorinated biphenyls – PCBs) and a few pesticides (DDT is a famous one). All of these come mostly from human activities. What they all have in common is that they are very hard for animals to break down and get out of their body. I treated those eggs with a chemical called ethoxyresorufin. A protein called CYP that is good at making changes to chemicals (including some pollutants) is also good at changing ethoxyresorufin into resorufin. 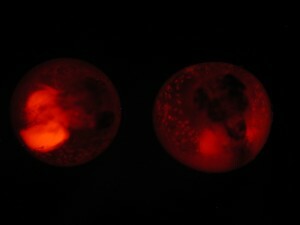 Resorufin glows bright red, so fish with a lot of CYP activity will have a bright red glow where the resorufin collects in their urine (like the egg on the left above). What kind of fish is the picture on the computer screen? The fish egg on the computer screen is another mummichog. It is only about 1 hour old. The dark circles on the right side of the egg are the 2 cells that will keep dividing and reshaping into the fish itself. They are attached to a big circle with lots of little circles on it – this is the yolk and oil droplets that the mother fish gives to the egg for energy so it can develop. Mummichogs take about two weeks to go from looking like that to a little baby fish, called a larvae, that can swim around on its own. As kids, what can we do so fish don’t get poisoned? This is a very important question because you can do a lot! One of the biggest things is to follow the instructions carefully on chemicals that you and your family use around the house. Groups like the EPA do a lot of work to determine how we can safely use these chemicals, and the results of that work are used in the instructions on the labels. Also, make sure you throw away your chemicals in the proper places. Remember that all waters are eventually connected, from your bath and sink to sewers to streams to rivers to the ocean. Most towns have special places to take chemical waste separate from your regular trash. I have also worked with a group called Safe Kids (www.safekids.org) that holds special days where you can bring in expired medicines to be properly disposed of instead of dumping them down the drain. Finally, you can work to reduce the overall amounts of certain chemicals that you and your family use. Even many things that we call pollutants are not necessarily bad, but we (and the fish) have problems when there is too much of them in the wrong places. A good way to prevent that is to be careful about how much we use.